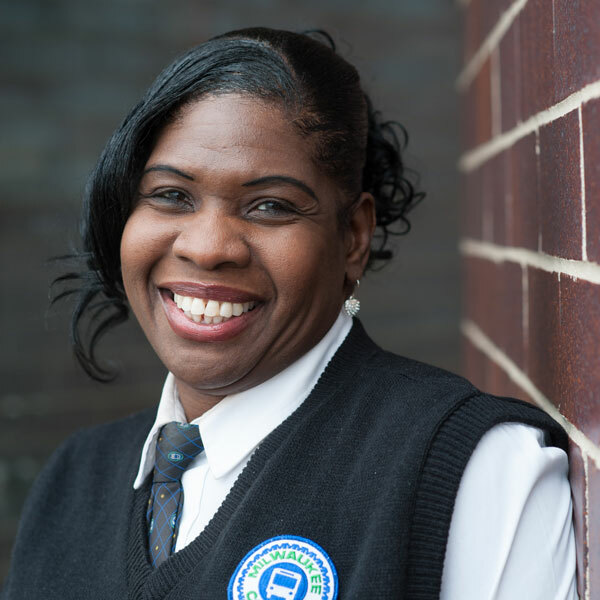 MCTS Driver Jeannie Mitchell’s alert reaction and maternal instincts helped save two Milwaukee children from a very scary situation. Jeannie was driving her usual Route 35 trip on Wednesday, October 12th, 2016, when she noticed two young children walking alone down the sidewalk on Hopkins Street north of Hampton Avenue. Jeannie stopped the bus, opened the door and asked the children if they were lost. “Sweetie, where ya’ll going. Who are you with?” she can be seen and heard asking the children on the buses camera system. Jeannie got off the bus to ask them more questions and realized the pair did not know where they were going. She contacted MCTS Dispatch who called police to the scene. A Milwaukee Police Officer helped the one-year-old boy and five-year-old girl contact their mom. The children say they walked away from their babysitter, and were trying to go to a relative’s house but got lost. Jeannie says she knows all too well how scary it can be to have a child missing. Nearly 25 years ago, her then 5-year-old son left a relative’s house and was missing for nearly 12 hours until a stranger helped bring him home. She says she is happy she was able to help another mom avoid going through that same thing.